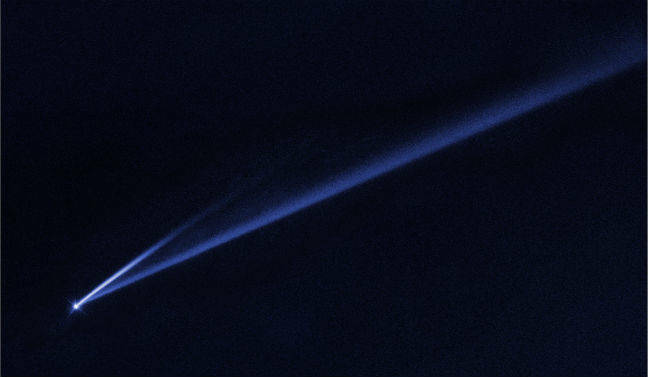 Pic The Hubble Space Telescope has captured a rare moment of an asteroid breaking apart, leaving trails of glittering dust in its wake. Measuring 2.3 miles across, the space rock known as 6478 Gault lies in the inner region of the asteroid belt, about 214 million miles (344 million kilometers) from the Sun. It was a pretty ordinary asteroid when first spotted in 1988 but at the start of this year scientists spotted it had grown two tails. The longer tail extends over a half a million miles (~800,000 kilometers) and is about 3,000 miles thick (4,800 kilometers), while the shorter one is about 125,000 miles long (~200,000 kilometers). “We didn’t have to go to Gault,” said Olivier Hainaut, a scientist at the European Southern Observatory, on Thursday. The streaks of material, moving at a couple of miles per hour, are made out of the asteroid’s matter being flung out into space as it furiously spins, like a Catherine wheel firework. NASA believe the implosion is down to the Yarkovsky–O'Keefe–Radzievskii–Paddack (YORP) effect, a process that describes how asteroids pick up angular momentum to start rotating more quickly over time. Photons from the Sun’s rays heat up small space rocks, but as heat that escapes it creates a tiny torque that makes the rock spin. Over time - a lot of time - the rate of rotation increases and can overtake gravitational forces, causing the asteroid’s surface to come apart. There are about 800,000 known specimens in the asteroid belt, scientists believe the YORP effect destroys about one asteroid a year. Gault has probably been spinning for more than 100 million years before it began disintegrating.